Leaving Israel, passing through the future, and arriving in Sri Lanka. It was difficult to leave Israel with a good taste in my mouth. Trains and buses were sleeping due to a holiday, and the hostel told us it was a flat fare for a taxi to the airport. I found an extremely likeable professional dancer from Holland to share the cab with, and away we went. Halfway there the driver asked which terminal we needed. Dancer Man was on a budget carrier, Terminal 1, and I was on Royal Jordanian, Terminal 3. “The price you paid only covers one terminal. Another 40 shekels to go to the other.” That’s just over $10. Then I was scanned, swabbed, and under suspicion before I even entered the terminal. Then I stood in front of the bag inspection corral, where 3 of the 13 to 16 staff were actually working, slowly, and waited for my turn to have my underwear spread across the desk and rubbed with a magic wand. I knew I needed to do laundry, but this was just embarrassing. I sat there planning my packing list for next time. 1 leather T-shirt/harness, 3 blow-up dolls, 5 vibrators, 7 riding crops…would that be a mitzvah? I had two flights to reach Sri Lanka, changing planes in Amman, Jordan. That was a big hit. I had to try and explain why I was stopping there…on Royal Jordanian Airlines. Given the assortment of words that were floating around my head, the theory was the less words I actually used, the less likely I was to get in trouble. My second flight had been canceled, so for the second time in the last three years I was flying to Dubai to be passed off to Emirates Airlines. This is not a problem, because Emirates is fantastic, and the airport is a trip in itself. Hard to tell (I was running to my gate) but that black wall is actually a waterfall. I’ve been to some over-sized and ostentatious airports (see: Ben Gurion in Tel Aviv) but nothing matches Dubai International for sheer sci-fi spectacle. 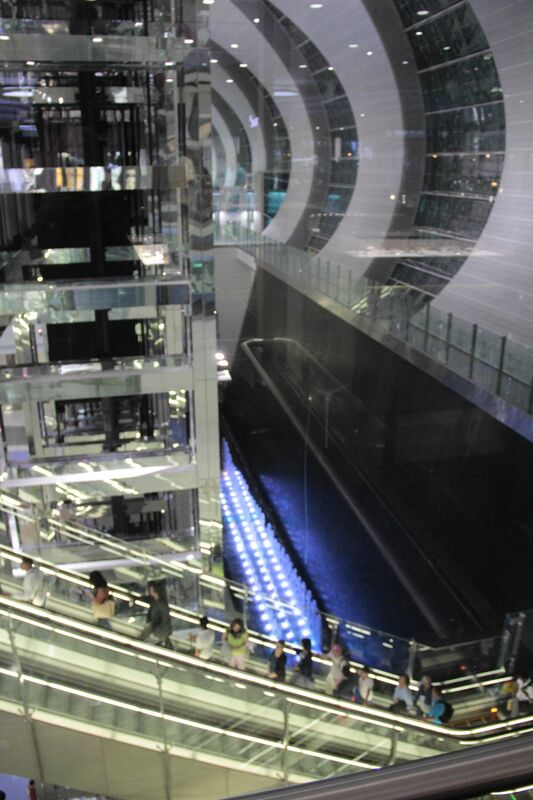 You walk for miles through a canyon of subtle commercials and stylish ornamentation, ascend and descend escalators alongside 3-storey waterfalls, and pass hi-tech displays that are ready for Tom Cruise in futuristic white haute couture to chase an alien villain past at any minute. Take a train, because, hey, why not? Eventually you reach Terminal A to find yourself inside the massive arching ribs of an international transportation behemoth, but luckily it swallowed some nice bathrooms too. I brushed my teeth and took a seat behind Jimmy Buffet’s younger brother, who was telling a lengthy story about calling his credit card company to two women who were both immersed in their phones. Dripping down through it all was the awareness that last time I walked those corridors I was with K, our backpacks stuffed with toothbrushes for kids in South Africa. Her absence this time made every bench into a memorial as I wondered “Is that the one where we fell asleep on each other’s shoulder? I wonder if the guy whose giant hairy arms flopped into my side of the armrest noticed my refusal to look up. 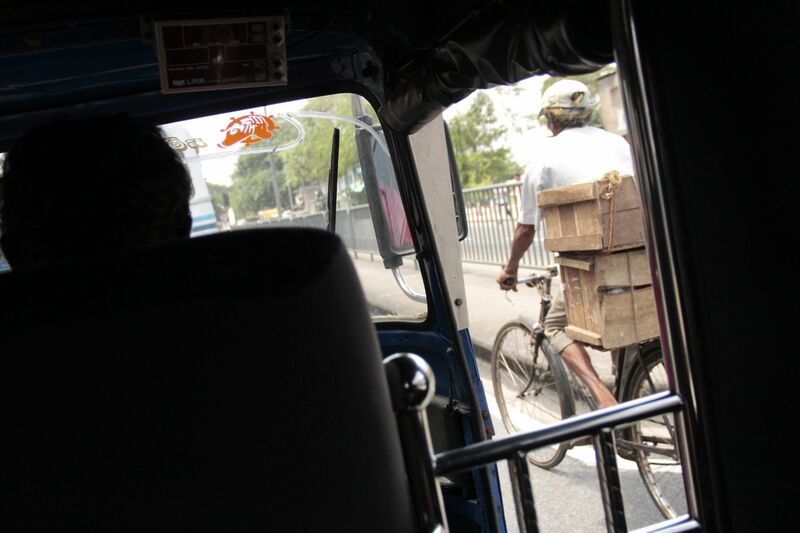 I didn’t think I’d fall asleep in the back of a tuk tuk…good thing I put the camera away first. A sleepless interlude in the surreal world of air transport, Gangster Squad showing on my tiny screen, and then I was in Colombo. I navigated the customarily poorly-marked process of visa and immigration, then through the waiting taxi drivers to reach the local bus across the street. I got on, heard Sri Lankan music, talked to four women in brilliant-colored saris who giggled at me, and saw the scurry of 3-wheel tuk-tuks that dominate this hemisphere. I was exhausted, hungry, and completely in love with travel. Hi, thanks for your answer on the Mardin posting. After seeing your stories of Israel, I am starting to feel that my “unfair” preconceptions of the country are being confirmed by you. I’m going to go anyway, but my curiosity is starting to get tinged with apprehension. The third-degree at your leaving was strange: we mostly hear about Arab countries not being happy if you have an Israeli stamp on your passport, not the other way around. Gee, in just the last 2 years I have been to Morocco twice, as well as Tunisia once! When I hit Ben Gurion airport, I will also have 7 visa stamps for Turkey on my passport too. I am looking forward to reading your impressions of Sri Lanka: it is a place that has been on my wish list, well ahead of India, but the distance has always discouraged me. Anyway, have a good time there. I think we are on the same footing. 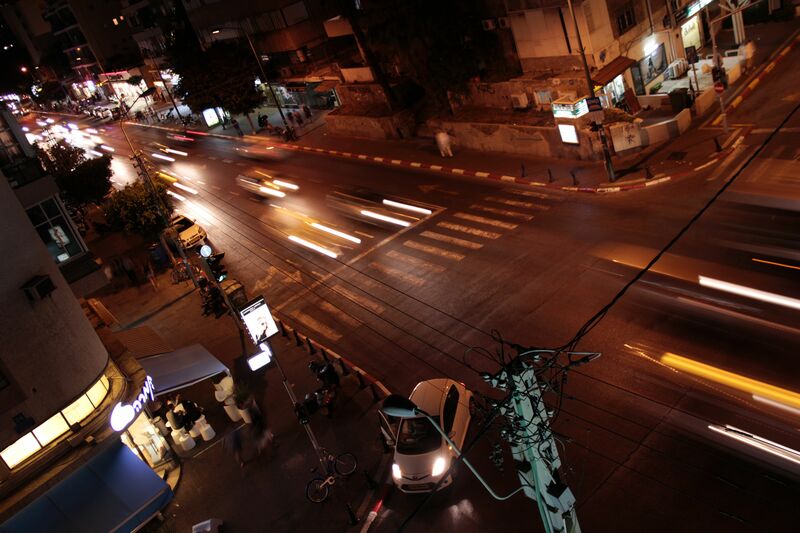 The reason I wanted to go to Israel was to understand it and its people better. The Israeli people have quite a reputation in the world, but I know that they are good people, normal people, just like everyone. To my disappointment, my week there did not give me the human compassion that I had hoped it would. It seemed to me to be the most ego-driven place I have ever seen (in the conventional sense, but more importantly in the Eckhart Tolle sense). But I still think the country is a good one, and the people are good. When I was there I admit to thinking “I never want to come back to this place” but now I think I need to even more importantly than before. It doesn’t make sense to harass someone so much who is leaving, but it’s unfair of me to judge an entire people on the misbehavior of airport security! I think it is a very good idea for you to go, see if for yourself, and try to see it all with a fair and compassionate mind. I managed at moments, but I hope you will be able to do so more consistently! Hi, how are things? I was glad to see from your latest posting that you were feeling less emotionally upset and that you were getting a lot of human input. From your experience, I feel forewarned about Israel at least, and will not expect cheerful greetings from strangers in the street! Thanks for mentioning Eckhart Tolle: I didn’t know his work, and have started reading his first book about staying in the Now. Excellent, I’m always glad to pass along the Tollemeister, despite my reactionary fear of referencing pop culture psychology…although that’s a pretty ego-based concern… That’s the tricky balance, is having fair expectations so disappointment doesn’t lead to combativeness, but still maintaining a good-natured attitude that is more likely to induce the same. I think they maybe also just have a brusqueness that is easy to mistake for arrogance and/or aggression. That’s just not my style. Hi. I was a bit worried about your watch incident, but I was pleased to see that you and your dog friend, Alex, seem to be doing well with the world again. Have you ever been to Paris? The Parisians seem to be known for their “brusqueness”, as you diplomatically phrase it. I used to be shocked and wounded personally by their style, but then I got out of my little self-centred cocoon and noticed that they are like this to each other too. Somehow that made it easier for my wounded ego!